John Marzluff is a professor of wildlife science at the University of Washington and author of In the Company of Crows and Ravens, Gifts of the Crow, and Welcome to Subirdia. His work is featured on the PBS documentary TV show Nature in the episode A Murder of Crows. Read his blog on Psychology Today here. From University of Washington Professor of Wildlife Science John Marzluff, winner of the Washington State Book Award, comes a research-driven examination of how animals adapt to thrive living among humans in our urban and suburban environments. Marzluff offers countless engaging stories of populations and communities of animals, with an Welcome to Subirdia presents a surprising discovery: the suburbs of many large cities support incredible biological diversity. Populations and communities of a great variety of birds, as well as other creatures, are adapting to the conditions of our increasingly developed world. 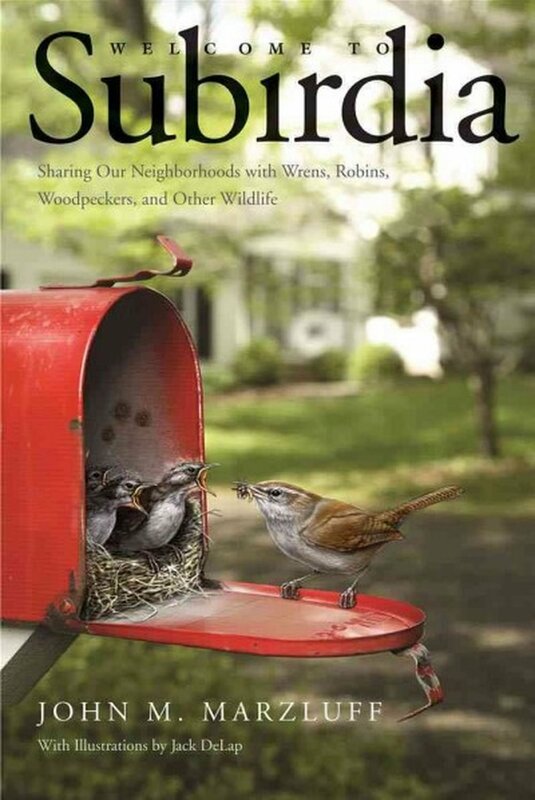 In this fascinating and optimistic book, John Marzluff reveals how our own actions affect the birds and animals that live in our cities and towns, and he provides ten specific strategies everyone can use to make human environments friendlier for our natural neighbors. Over many years of research and fieldwork, Marzluff and student assistants have closely followed the lives of thousands of tagged birds seeking food, mates, and shelter in cities and surrounding areas. From tiny Pacific wrens to grand pileated woodpeckers, diverse species now compatibly share human surroundings. By practicing careful stewardship with the biological riches in our cities and towns, Marzluff explains, we can foster a new relationship between humans and other living creatures—one that honors and enhances our mutual destiny. on birds, who have adapted both behaviorally (such as singing at lower frequencies to be heard through traffic noise) and physically (changing plumage colors) to co-exist in an increasingly developed world. He also sets forth unexpected and intriguing strategies humans can easily employ to sustain and celebrate the diversity of wildlife that calls our yards, gardens, parks, and cities home, and how you can make your own yard a safe haven. Crows are mischievous, playful, social, and passionate. They have brains that are huge for their body size and exhibit an avian kind of eloquence. They mate for life and associate with relatives and neighbors for years. And because they often live near people—in our gardens, parks, and cities—they are also keenly aware of our peculiarities, staying away from and even scolding anyone who threatens or harms them and quickly learning to recognize and approach those who care for and feed them, even giving them numerous, oddly touching gifts in return. With his extraordinary research on the intelligence and startling abilities of corvids—crows, ravens, and jays—scientist John Marzluff teams up with artist-naturalist Tony Angell to tell amazing stories of these brilliant birds in Gifts of the Crow. With narrative, diagrams, and gorgeous line drawings, they offer an in-depth look at these complex creatures and our shared behaviors. The ongoing connection between humans and crows—a cultural coevolution—has shaped both species for millions of years. And the characteristics of crows that allow this symbiotic relationship are language, delinquency, frolic, passion, wrath, risk-taking, and awareness—seven traits that humans find strangely familiar. Crows gather around their dead, warn of impending doom, recognize people, commit murder of other crows, lure fish and birds to their death, swill coffee, drink beer, turn on lights to stay warm, design and use tools, use cars as nutcrackers, windsurf and sled to play, and work in tandem to spray soft cheese out of a can. Their marvelous brains allow them to think, plan, and reconsider their actions. With its abundance of funny, awe-inspiring, and poignant stories, Gifts of the Crow portrays creatures who are nothing short of amazing. A testament to years of painstaking research and careful observation, this fully illustrated, riveting work is a thrilling look at one of nature’s most wondrous creatures.